If you’ve taken on the (often daunting) task of renovating a bathroom in your home, then you’re going to have plenty of hurdles to overcome and decisions to make. If you’re stuck on how to pick some of the key fixtures and features that will adorn your new bathroom, maybe we can help! When you set out to begin the later parts of a bathroom renovation (after demolition and reconfiguration), you’ll have to start making decisions. While this may sound like the fun part – it is, or at least can be – there is a method to painlessly navigating the daunting number of options you’re about to face. Okay, yes, we are a tile company, so of course we’d recommend tile first; regardless of our bias, however, picking your tile and deciding how it will be laid out first is a great idea, as it literally acts as the foundation for the styles and colors available to you throughout the rest of the process. For instance, if you decide to go with a sleek white subway tile in a standard brick format in your shower, you’ll then have to decide what you want to to do with the floor, and the walls, not to mention the ceiling, and so on. What we’re getting at is this: Picking all of the tile that will go in your bathroom – which could include any or all of the walls, perhaps each in their own tile type or format – is incredibly wise, as it will let you make an informed decision on what will work as far as style goes for vanity, sink, mirror, decorations, fixtures, and more. While we love talking about style and color, there is a certain functionality aspect to consider as well. After all, your family has to use this room throughout the day; in fact, the bathroom is typically one of the most important room or rooms in a home. If this is your personal bathroom, then you should focus on making it a retreat to get away from the anxiety and stresses of your day in the evening while making you feel invigorated and excited for what is to come whenever you get ready in the morning. Guest bathrooms, powder rooms, childrens’ baths, and laundry room/bathroom hybrids all have very different purposes that should be considered in their own way. While we want you to love the look and feel of your bathroom, not every vanity or mirror offers the same utility as bathroom tiles do while giving you the look you’re trying to go for, so just remember to take into account what you need out of the space as a non-negotiable feature! Whether you’ve already torn out your bathroom and are ready to move on to the next step or you’re still tearing your hair out, wishing for the bathroom of your dreams, it’s time to move on to the next step! 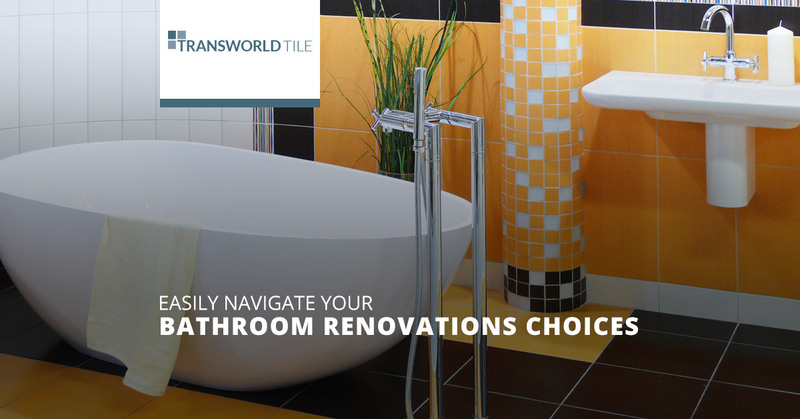 After you’ve determined when and how the initial work will get done and secured all corresponding permits, then it’s time to head down to Transworld Tile, Thousand Oaks’ most trusted source for bathroom tiles in all shapes and sizes. Check out some of our successful projects here!